The best way to spice up your prom dress is super easy, all you need to do is add some jewelries. However, it is somehow challenging to pick the correct ones that complement your dress without looking too much going on. Besides, thinking of which pieces can be showcased perfectly with your dress neckline is even more though. Does a lariat necklace looks flattering on a sweetheart neckline? 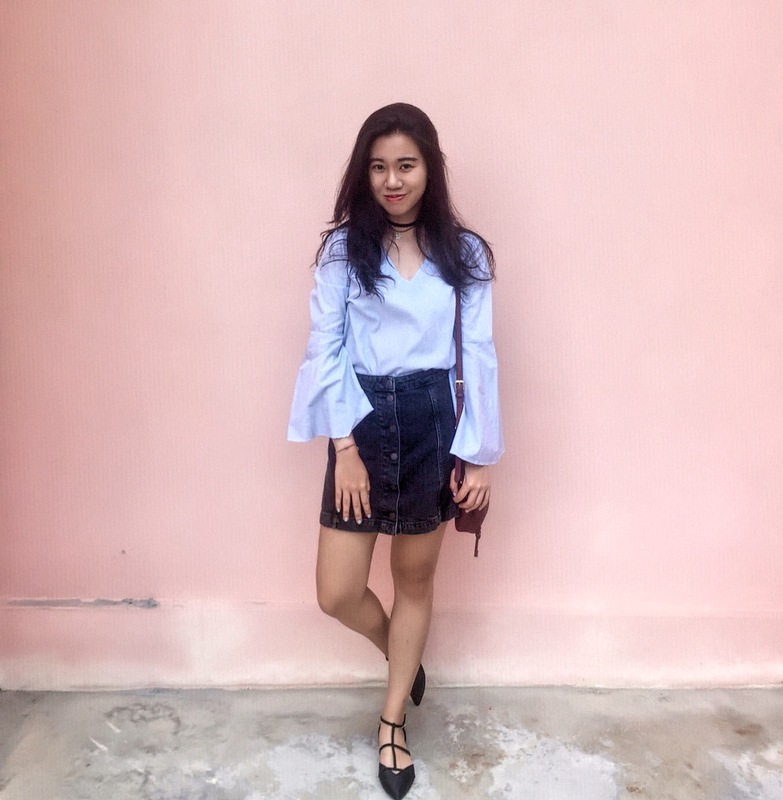 Can I wear statement necklace with my one shoulder dress? 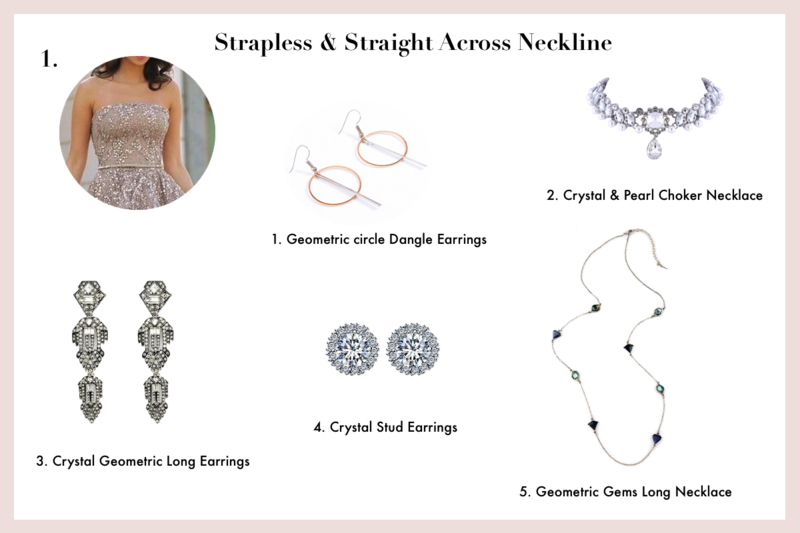 No worries, I’ve got you covered with some cool tips and pieces which will work best with your prom dress neckline. Keep scrolling and find out more! If you’re wearing a strapless and straight-across neckline, congratulations! As your choices are limitless due to this is the best neckline to showcase different types of jewellery. You can go for a bold statement earrings such as chandelier earrings, long earrings, teardrop earrings. Besides, a massive statement necklaces will also complement this neckline. In short, just wear something that you feel comfortable in when you have a clean straight-across neckline. 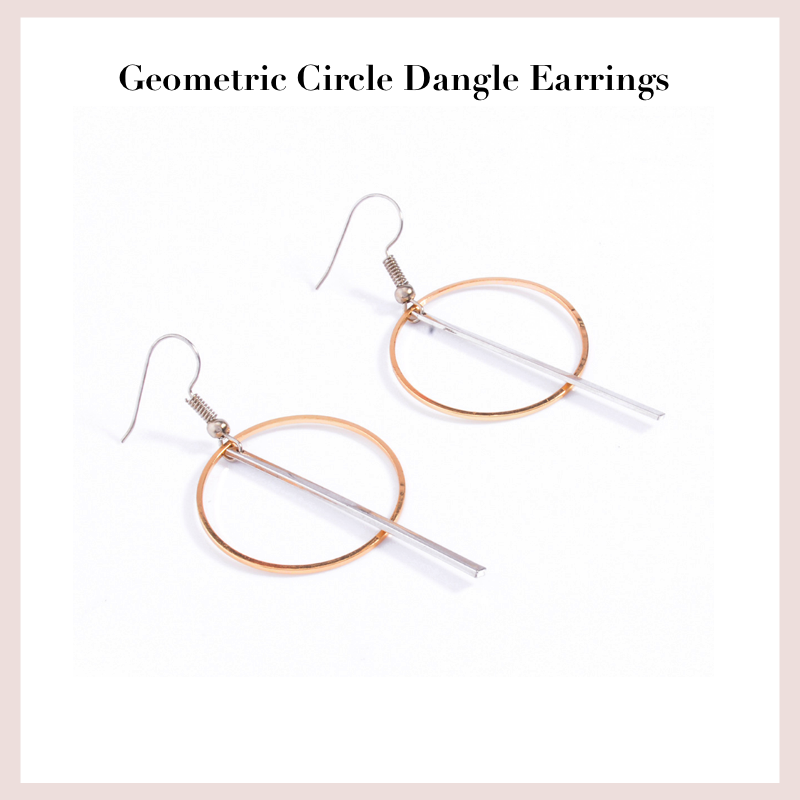 For the simple and sophisticated look, amp of the glam with this minimal pair of geometric circle dangle earrings which feature a golden hoop. 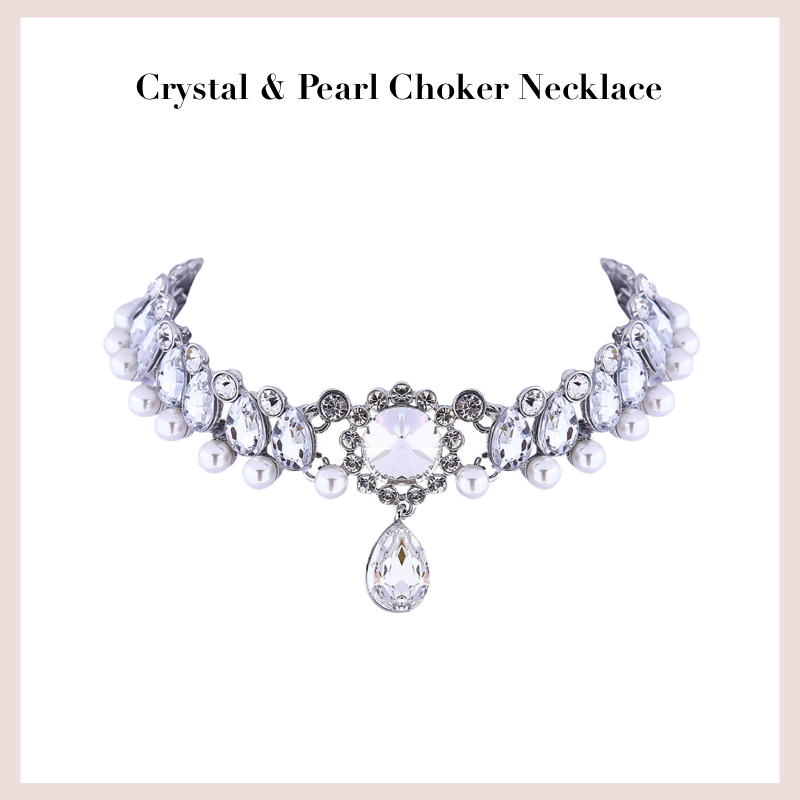 Choker is having a huge come back this year and this choker which featuring pearls and crystal embellishments is everything you need to make your look standout! 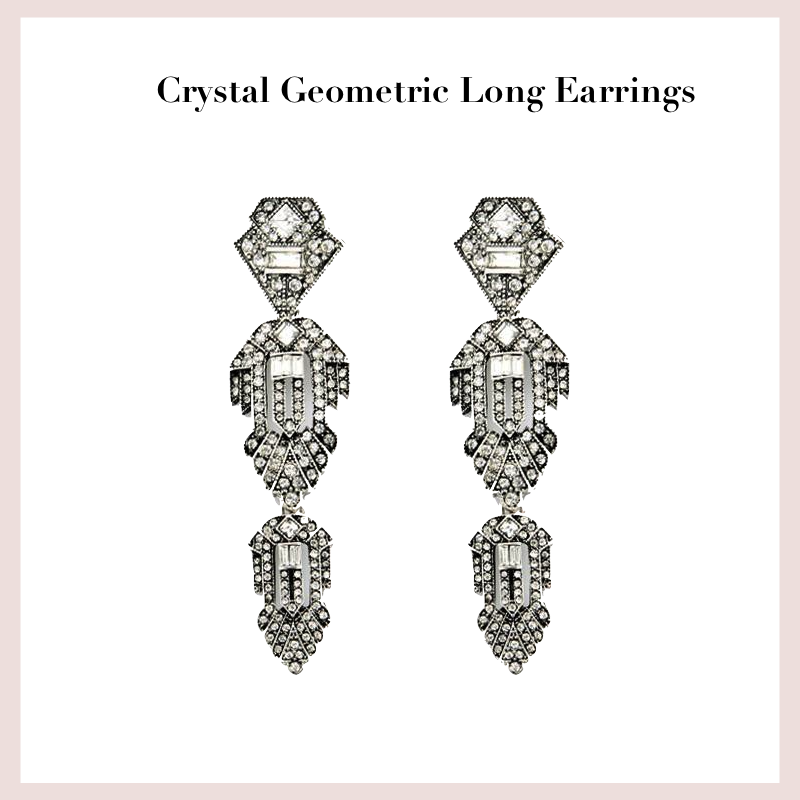 Add a splash of glitz with this bedazzling pair of long earrings which showcase crystal geometric pattern. 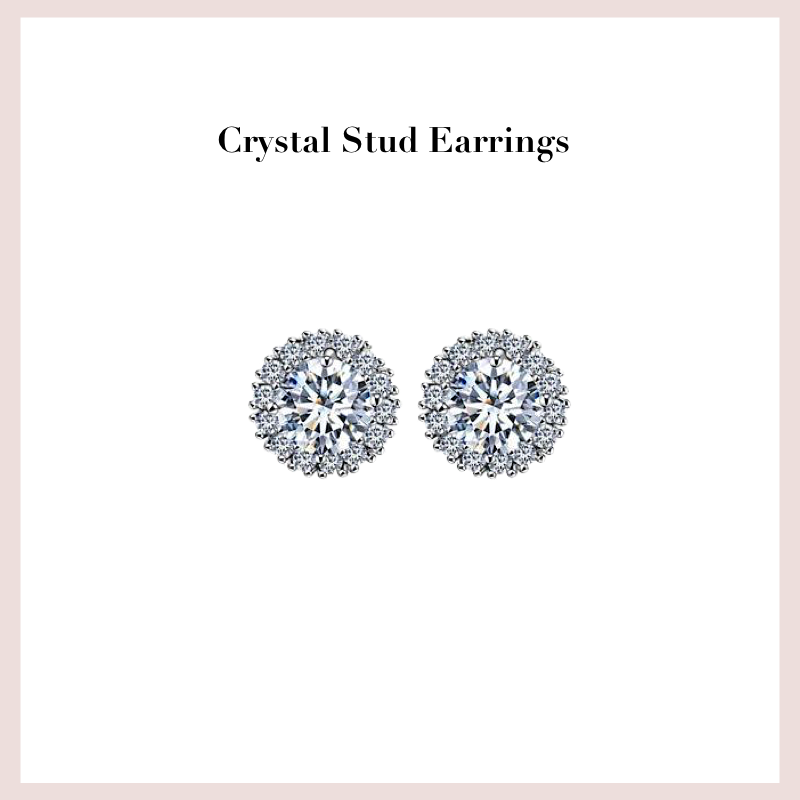 This pair of stud earrings which features crystal detailing is the perfect piece to inject a sense of luxe to your prom look. 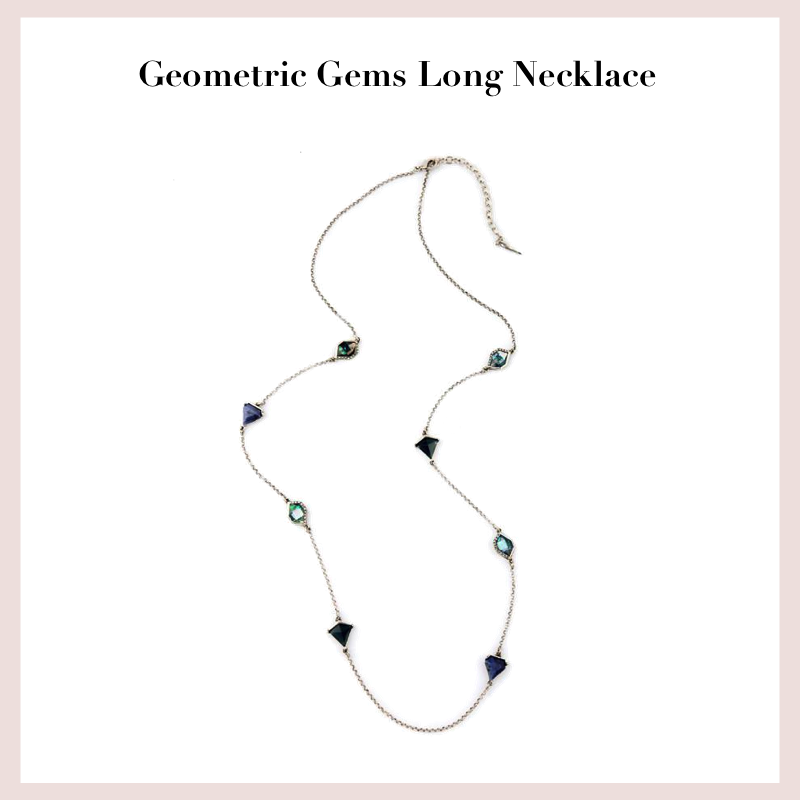 Make a show stopping prom look by wearing this unique and beautiful geometric gems long necklace. 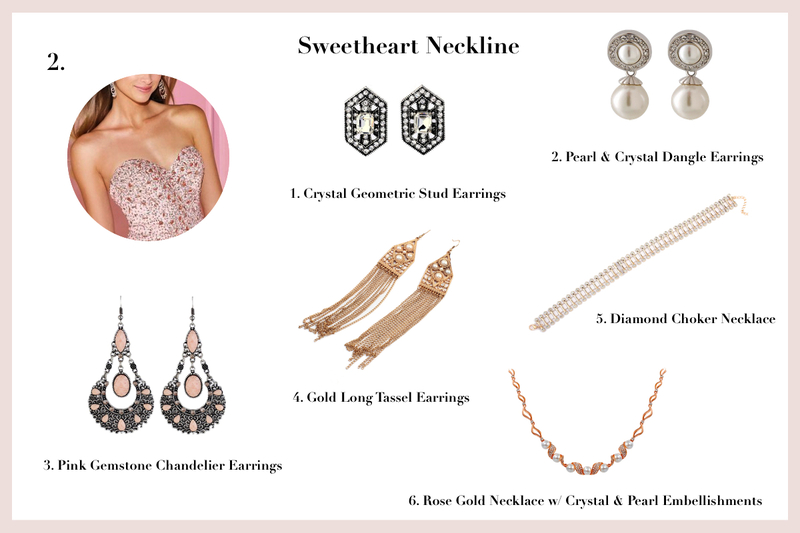 If you’re styling a classic sweetheart neckline that will accentuate your curves, your jewellery options are pretty open like the straight-across neckline. Regardless, its a minimal and subtle piece or a dramatic bold statement jewellery. However, bare in mind that try to keep from looking over-accessorized. stick to only one piece of jewellery. 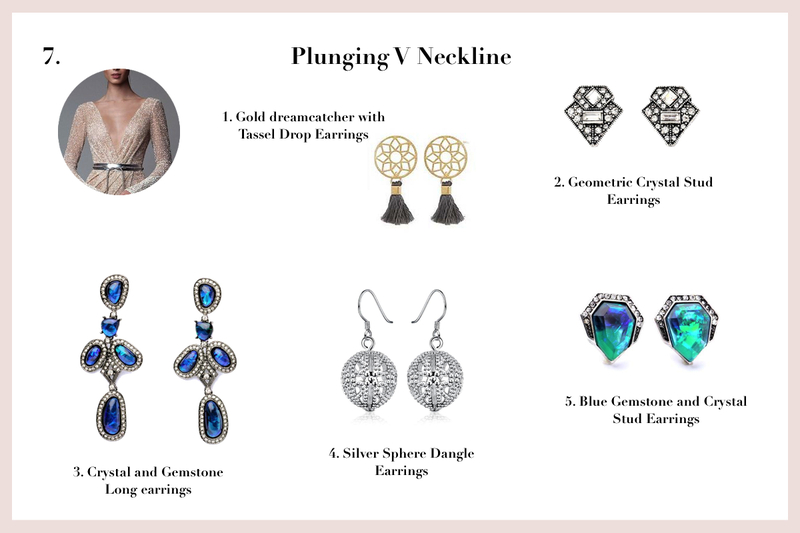 Either you go for a piece of earrings or a piece of necklace. 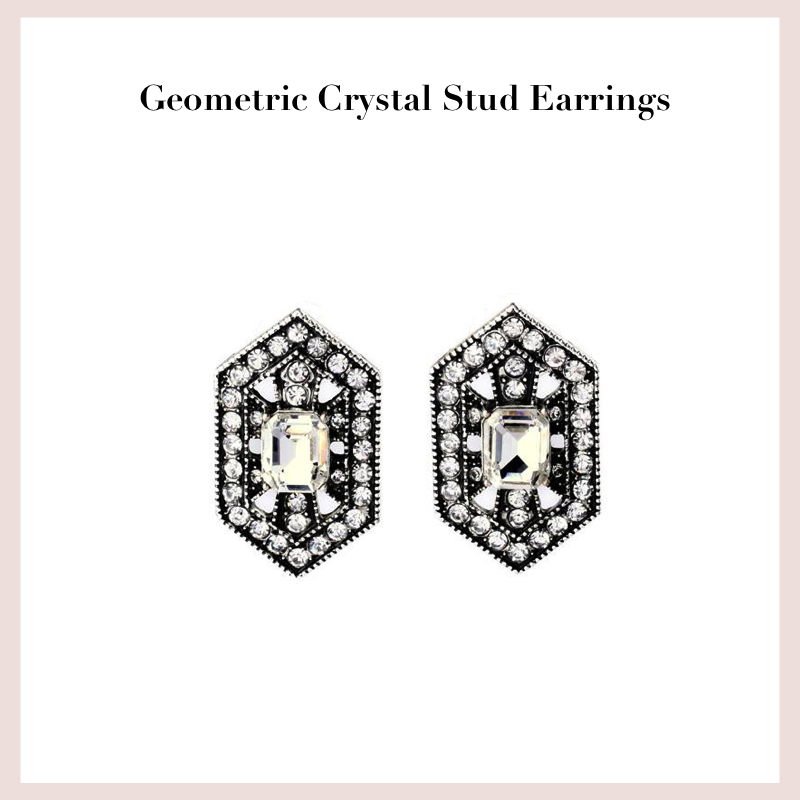 Spice up your prom look with this pair of glamorous geometric crystal stud earrings. 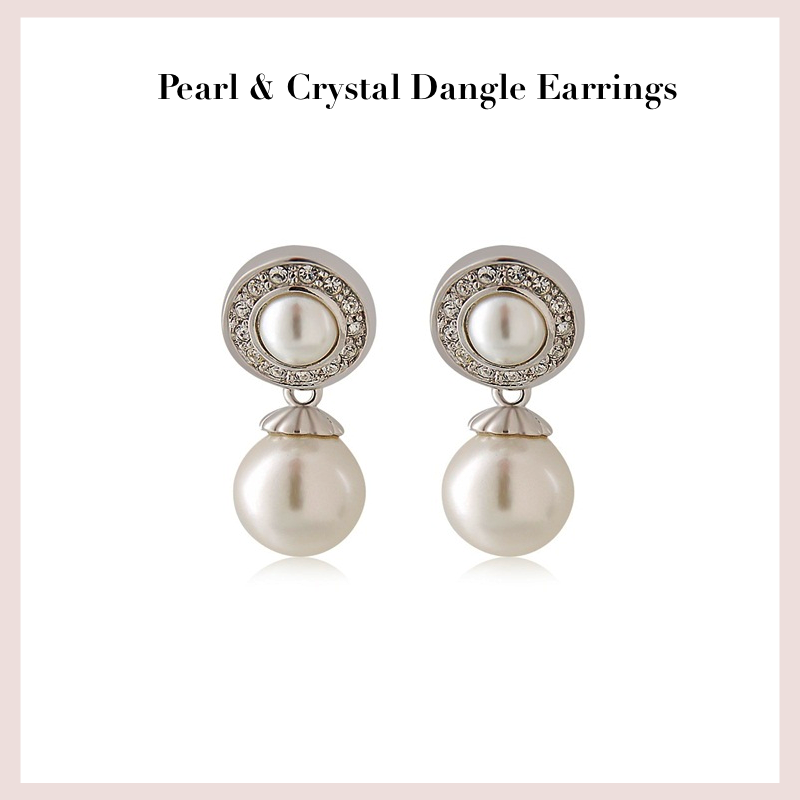 Create that ultimate classy prom look with this exquisite pair of earl and crystal dangle earrings. 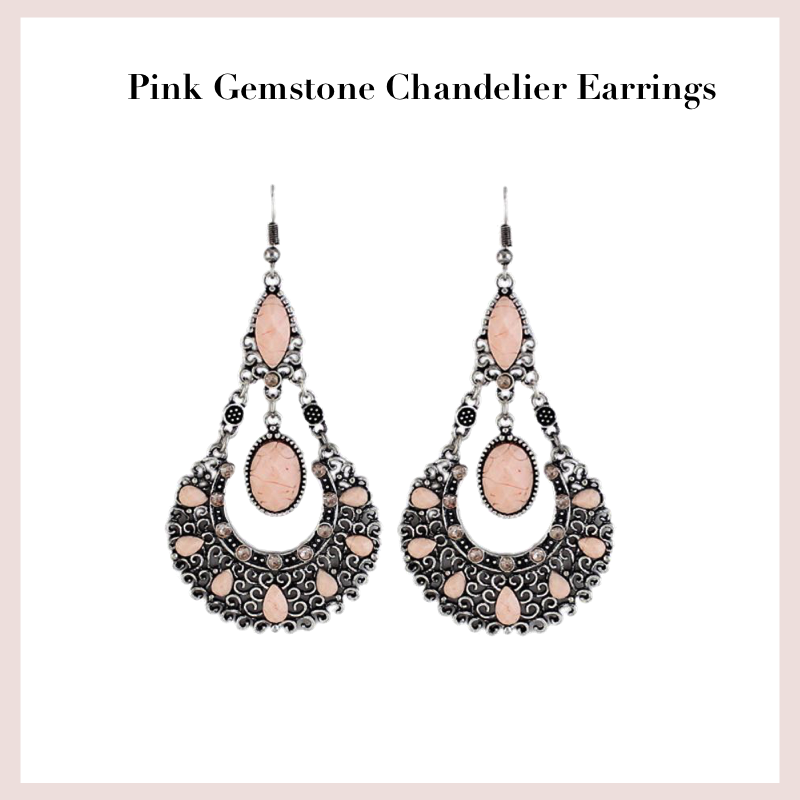 Think Pink this season with this lovely pair of pink gemstone chandelier earrings. 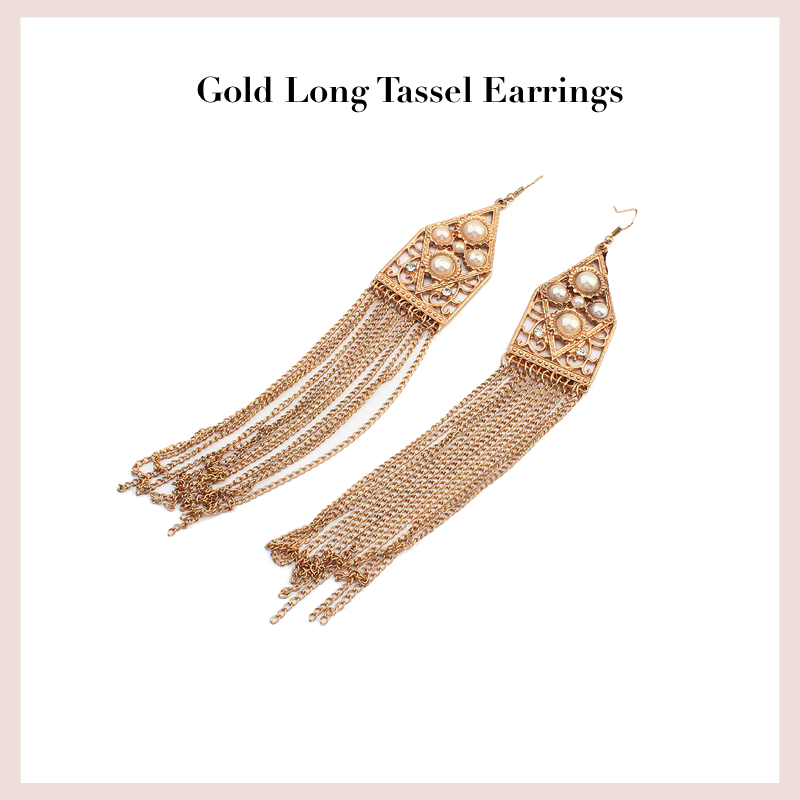 Add a little movement to your look with this glamorous gold long tassel earrings which features some pearl detailing. 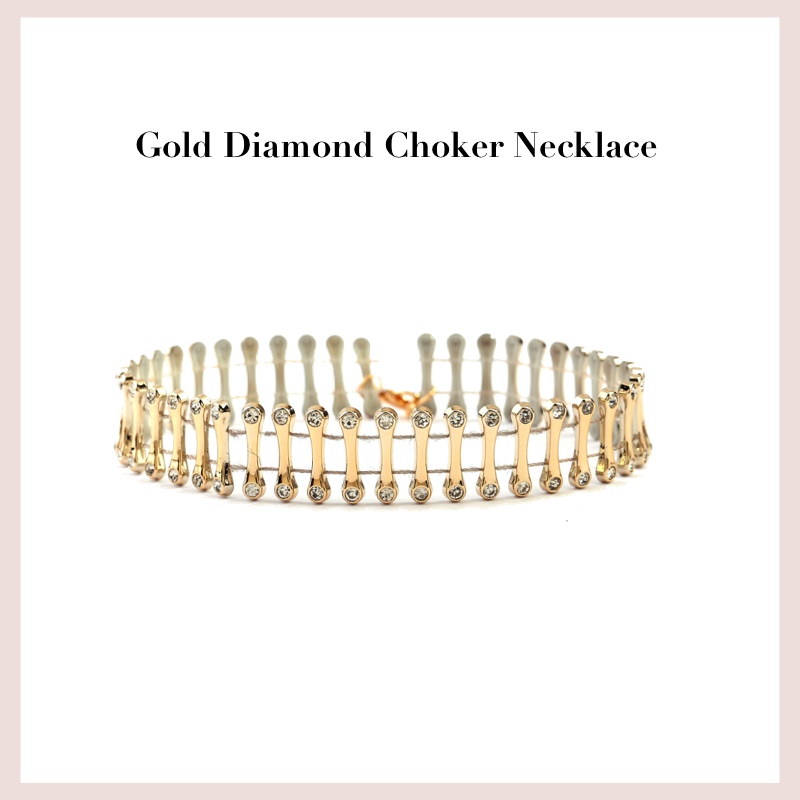 Inject a splash of edginess to your prom look instantly with this cool piece of gold and diamond choker. 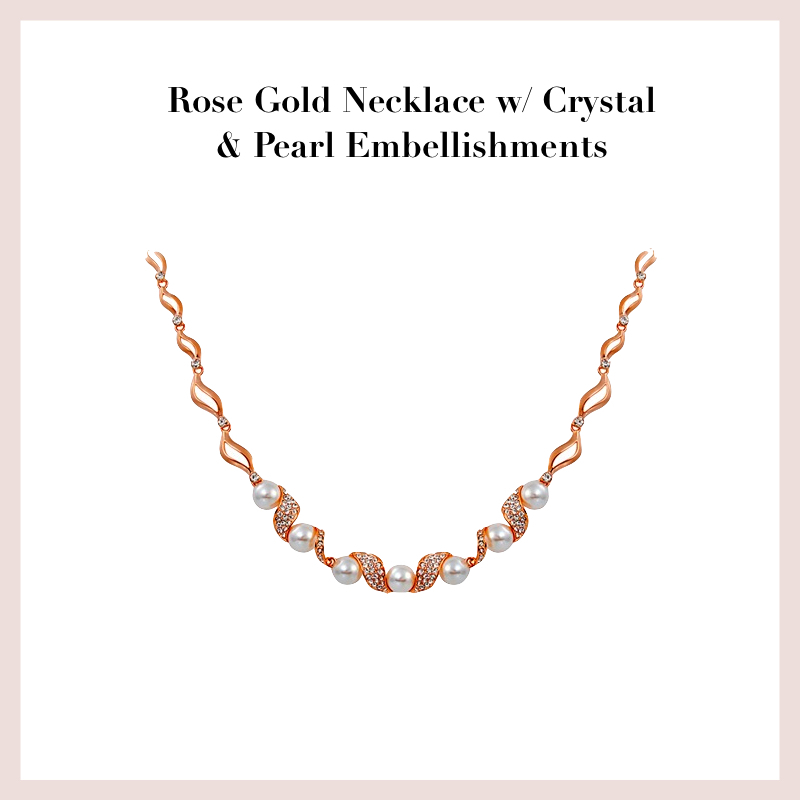 If you’re the rose gold freak, then this delicate rose gold twisted necklace with crystal and pearl embellishments is perfect for you! 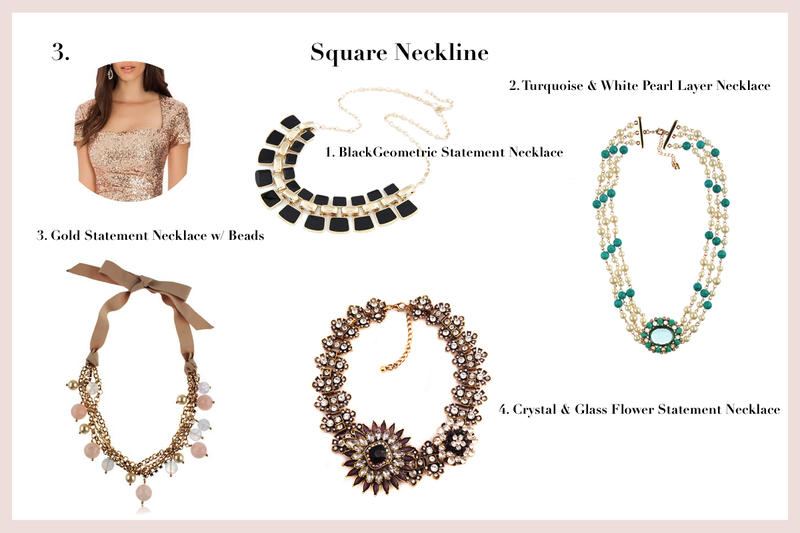 If you’re wearing a dress with a square neckline, a bold statement necklace will looks flattering! A square neckline naturally frames your chest, leaving it open for a beautiful necklace. 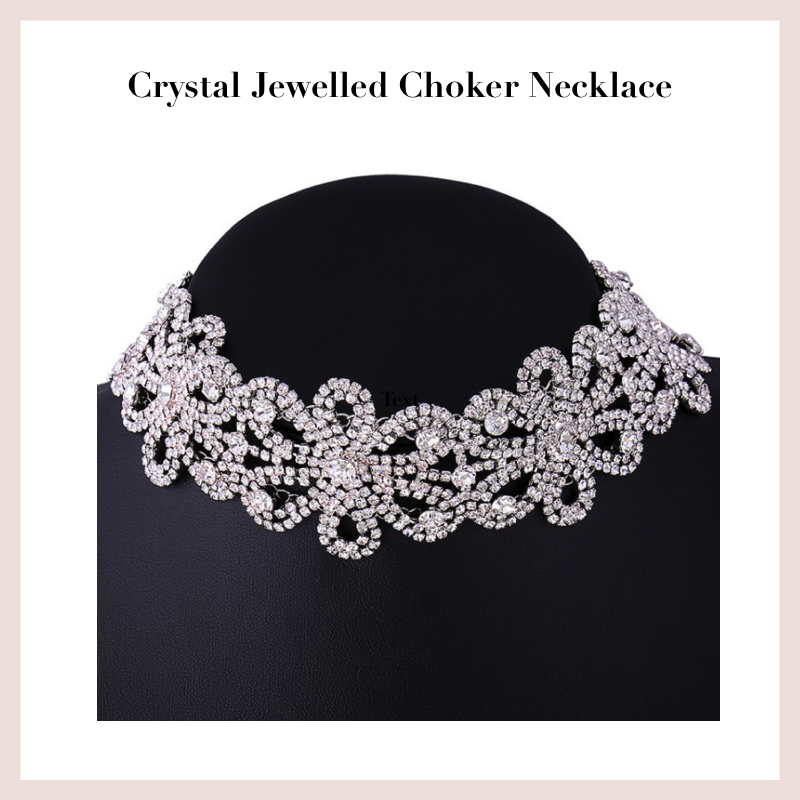 Whether it is a bold choker necklace or a collar necklace, it will complement you! 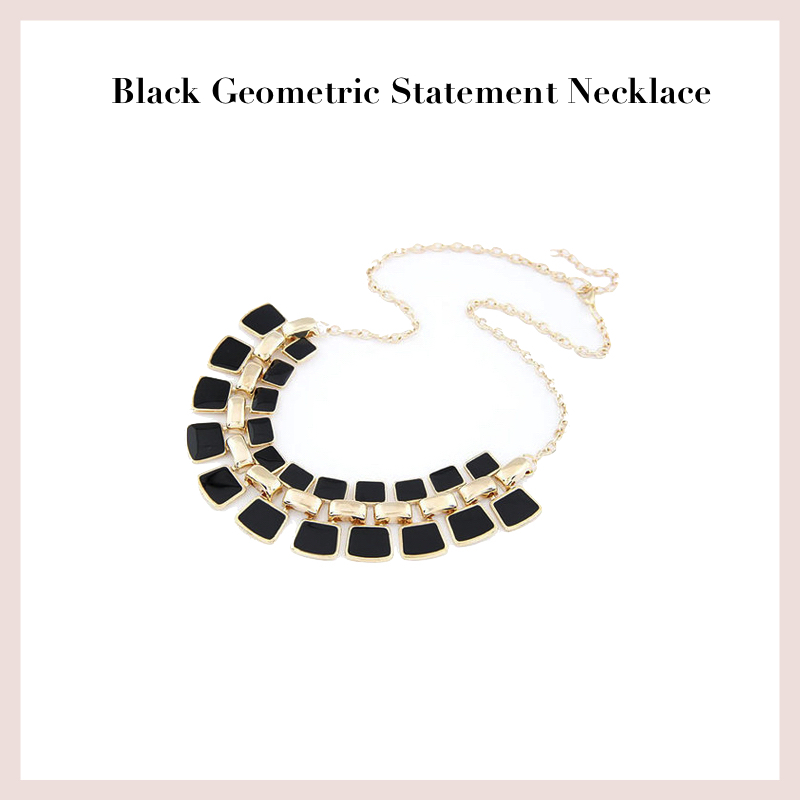 Stand out from the crowd looking fab wit this black geometric statement necklace. 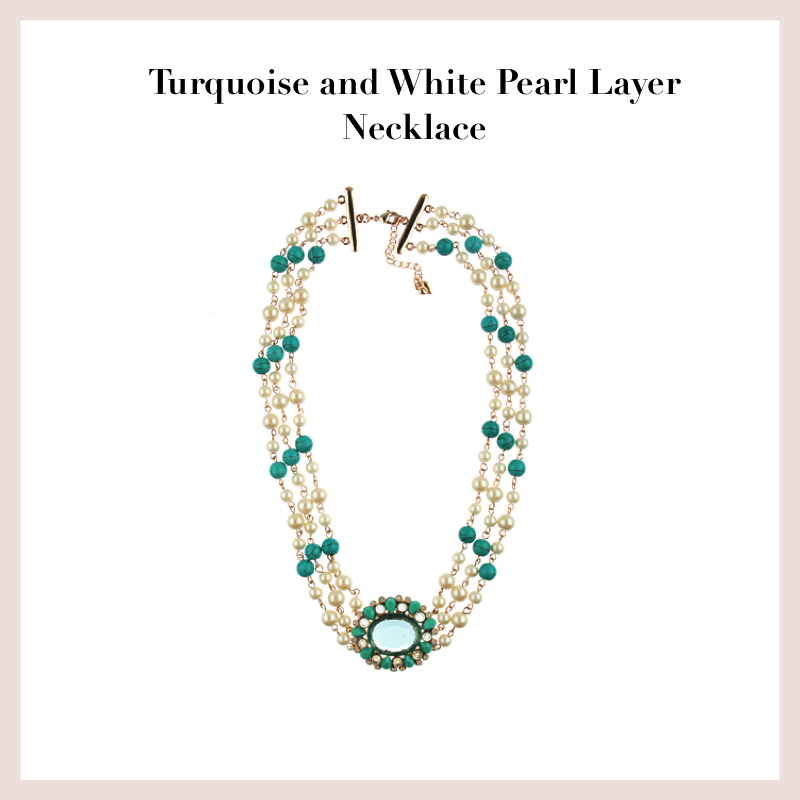 Your evening look will be anything but boring when you style this turquoise and white pearl layer statement necklace. 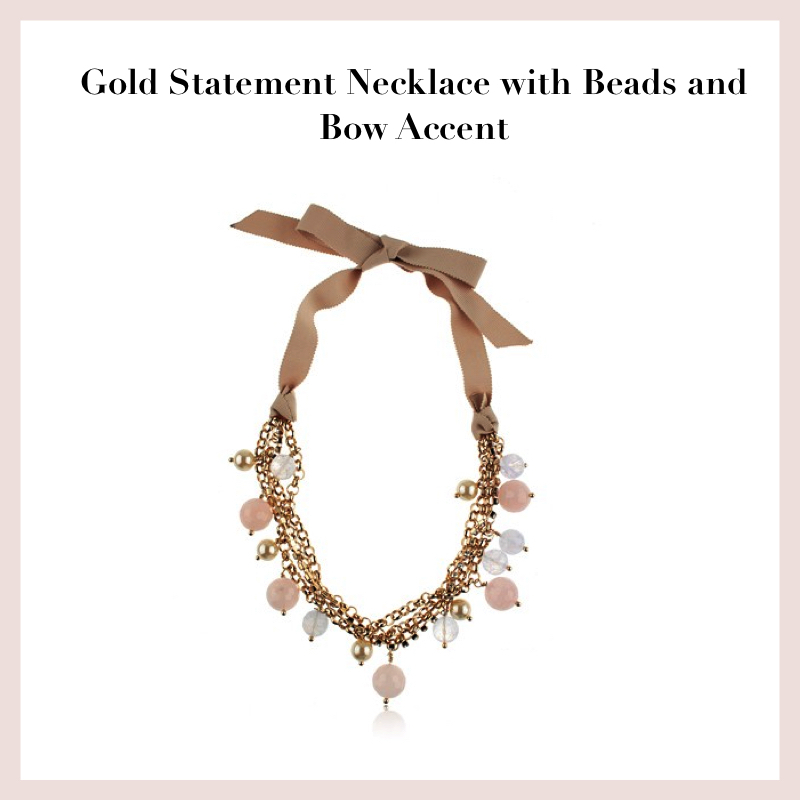 Add a splash of loveliness to your evening look with this pretty gold statement necklace with beads and bow accent. 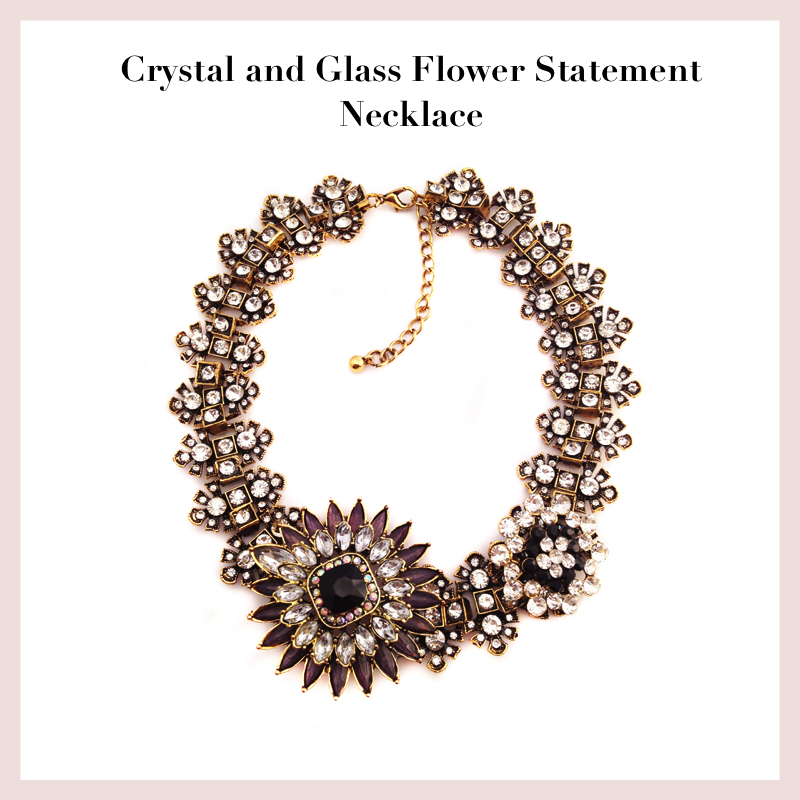 Look bold and dramatic when you wear this cool statement necklace that features crystal and glass flower embellishments. 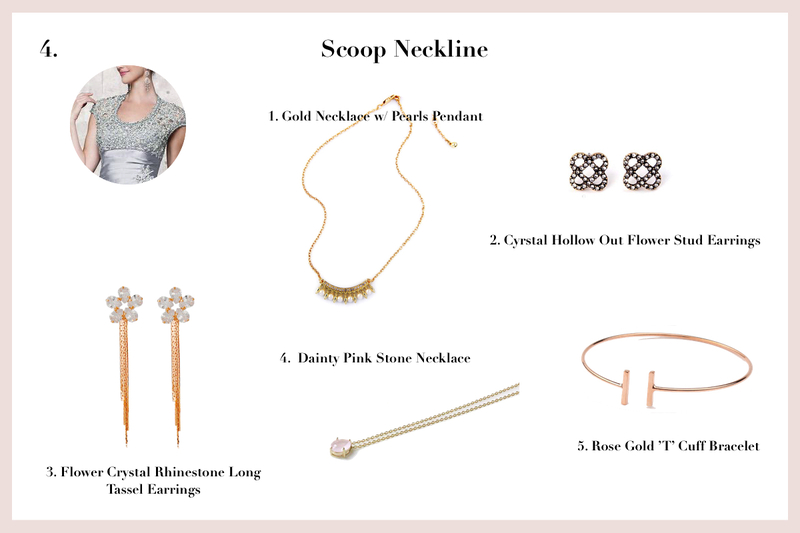 A scoop neckline is a traditional and feminine neckline. Hence, keep it simple, minimal and clean with dainty and exquisite necklace, bracelet and earrings. Never muddle it oversize jewellery. Accessories need not be big to be great. This exquisite dainty gold necklace with pearls pendant will add a splash of sophistication. 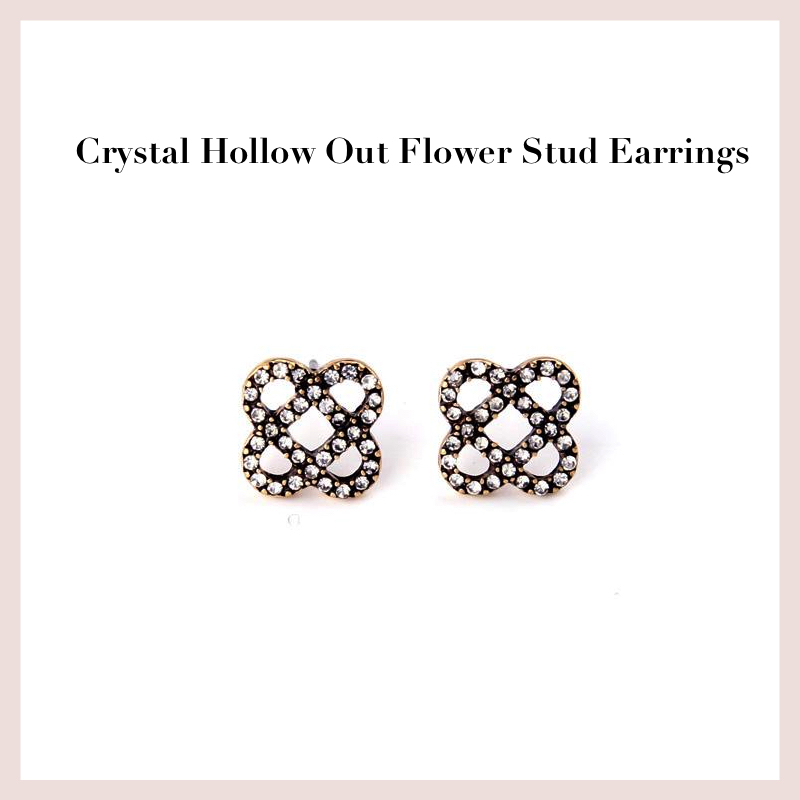 Inject a splash of glitz with this stud earrings that feature crystallise hollow out flower pattern. 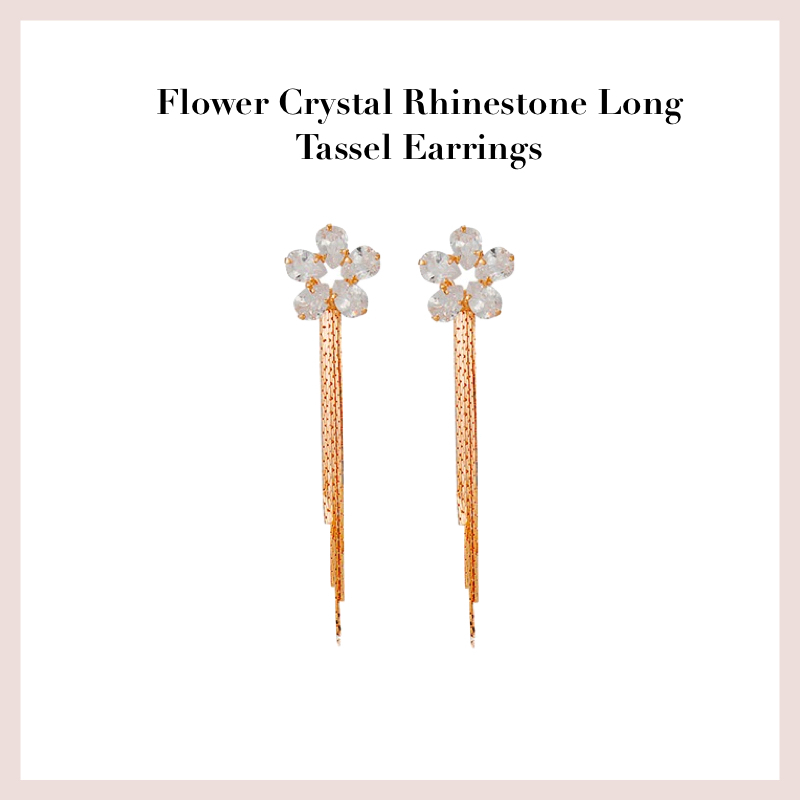 This beautiful pair of long tassel earrings is highlighted with flowers design crystal rhinestone. 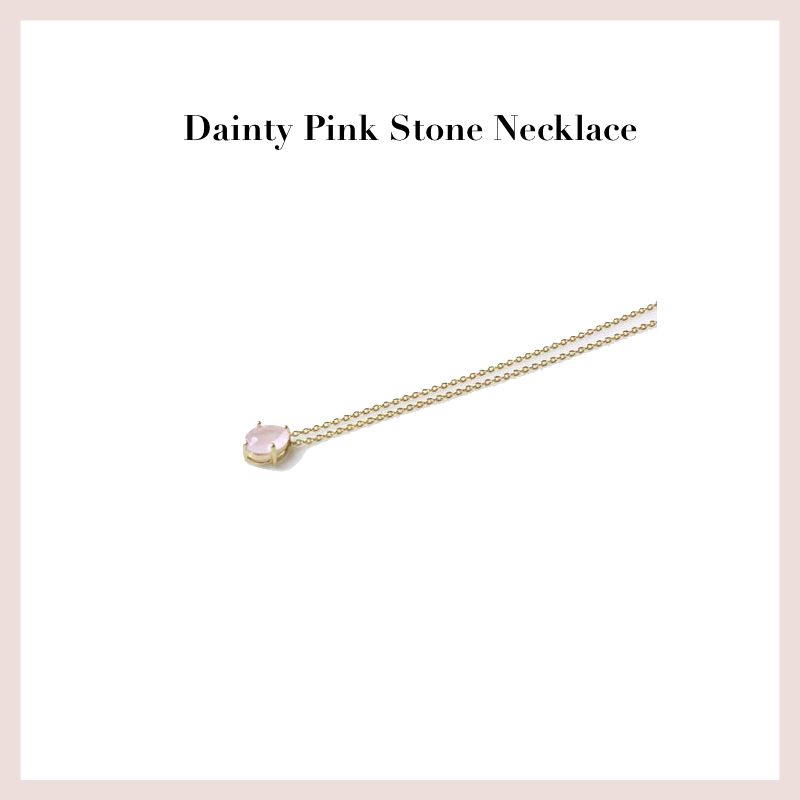 Look minimal and elegant when you wear this dainty pink stone necklace. 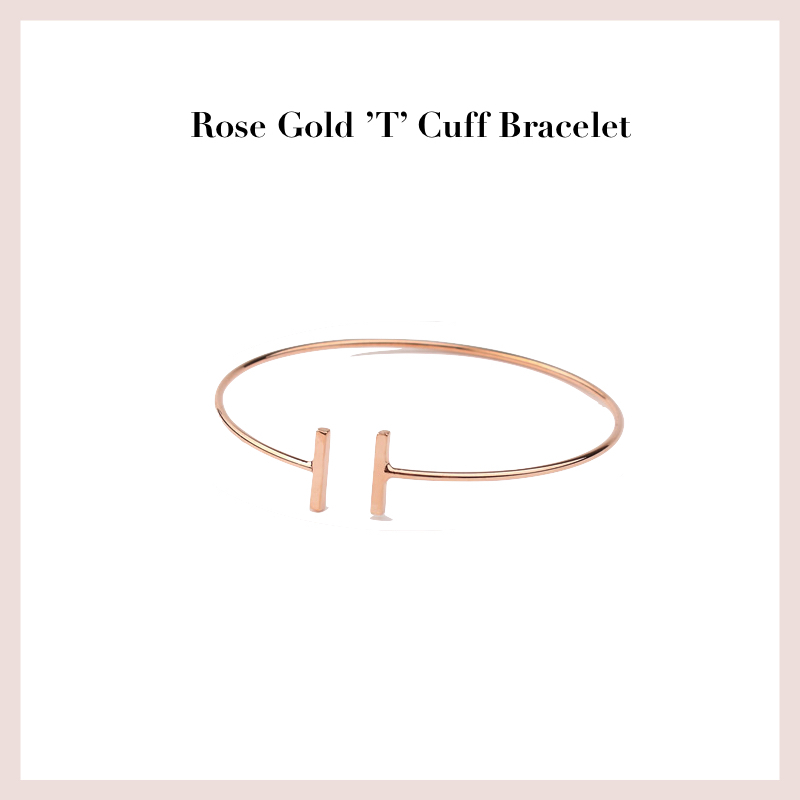 Add some detailing to your hand by wearing this beautiful and minimal rose gold ‘T’ cuff bracelet. Off the shoulder which is kind of similar with the strapless and straight across neckline enables you to style literally any and every kind of jewellery pieces. 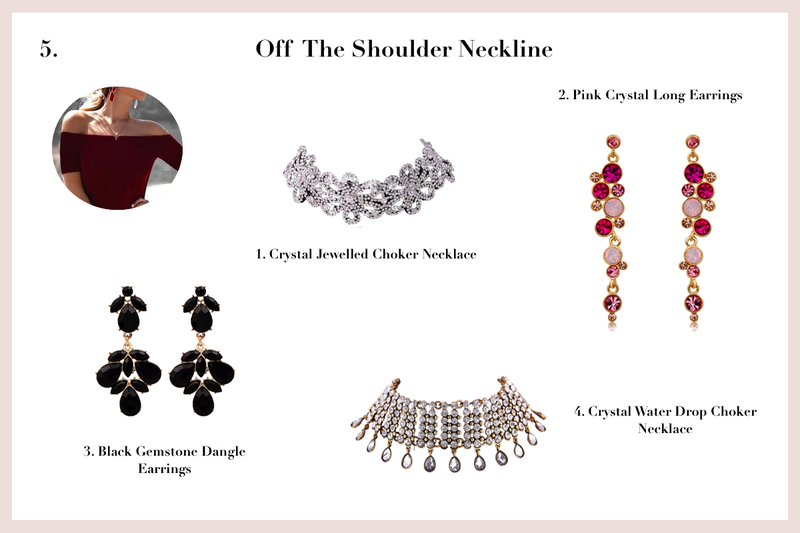 Since this neckline leaves a lot of skin bare, fill the space with chokers, statement earrings to bring the eye up. When you’re styling off shoulder pieces, this crystal jewelled choker necklace will instantly make your evening look pop with its dazzling effect! 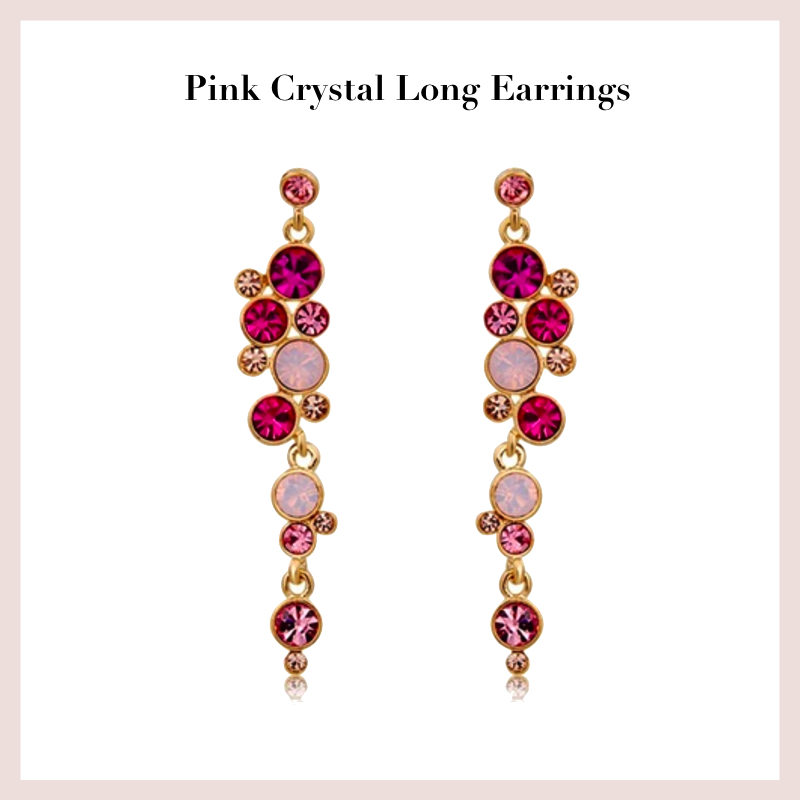 Give your evening look a splash of colour with this pretty and lovely pink crystal long earrings. Channel the all black theme with this gorgeous piece of dangle earrings that has this gorgeous black gemstone detailing. 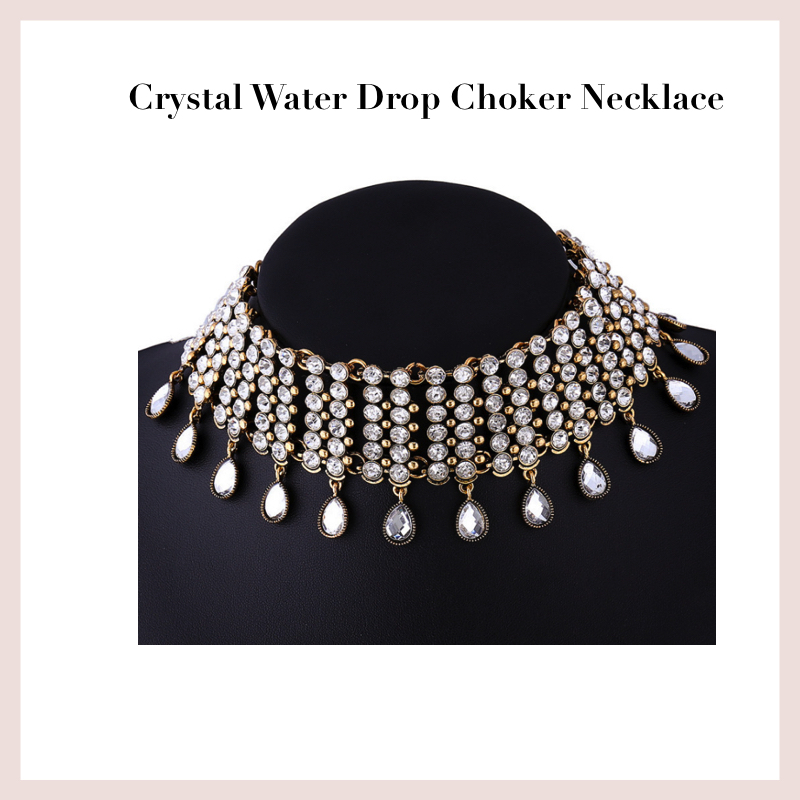 Look extremely luxe when you wear this crystal water drop choker necklace. 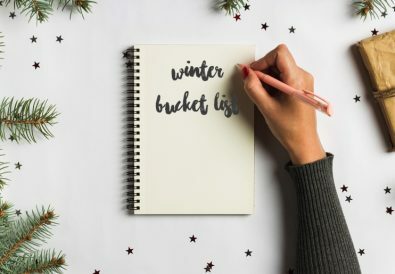 When you’re styling a high neckline, avoid necklaces and you should limit yourself to only one accessory to prevent yourself looking overwhelmed. 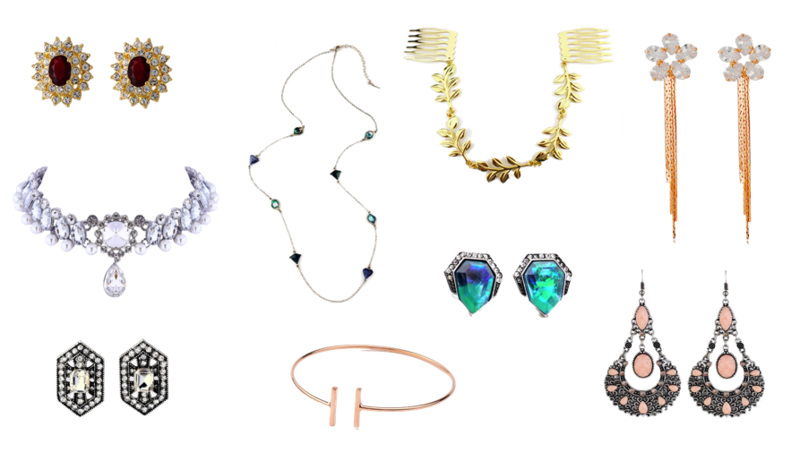 You can either go for stud earrings or hair accessories to spice up your look. 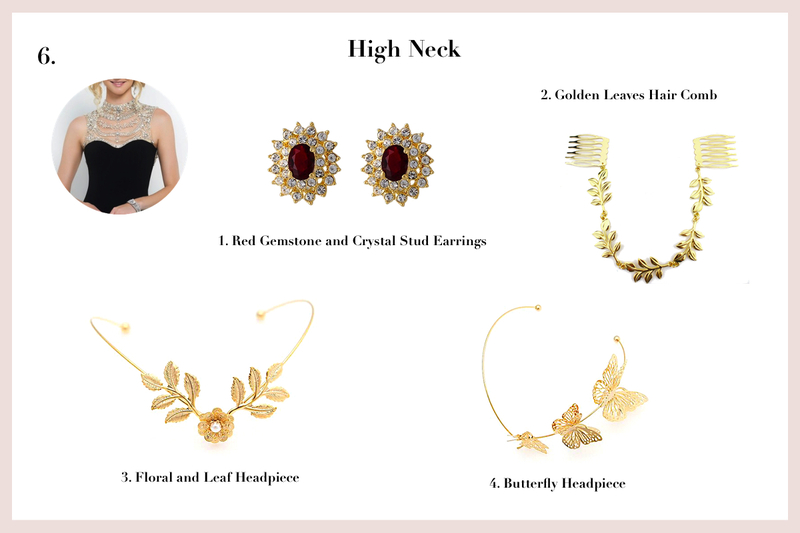 At the same time, these accessories add shine to your look without taking away attention from the detailed bodice. 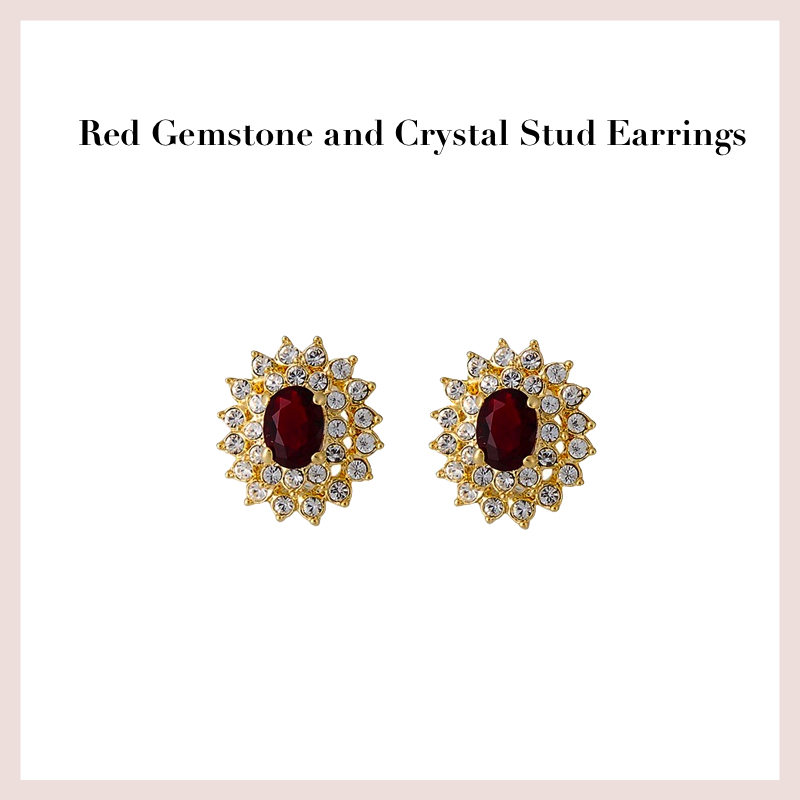 Add a splash of Victorian vibe with this exquisite and gorgeous red gemstone and crystal stud earrings. 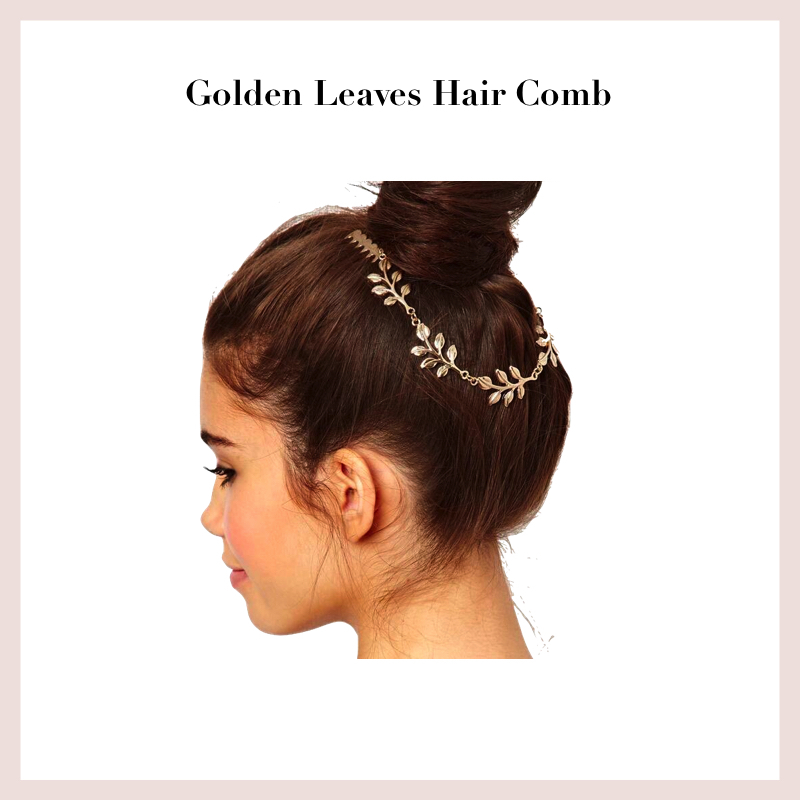 Make your hair anything but boring with this greek goddess inspired golden leaves hair comb. 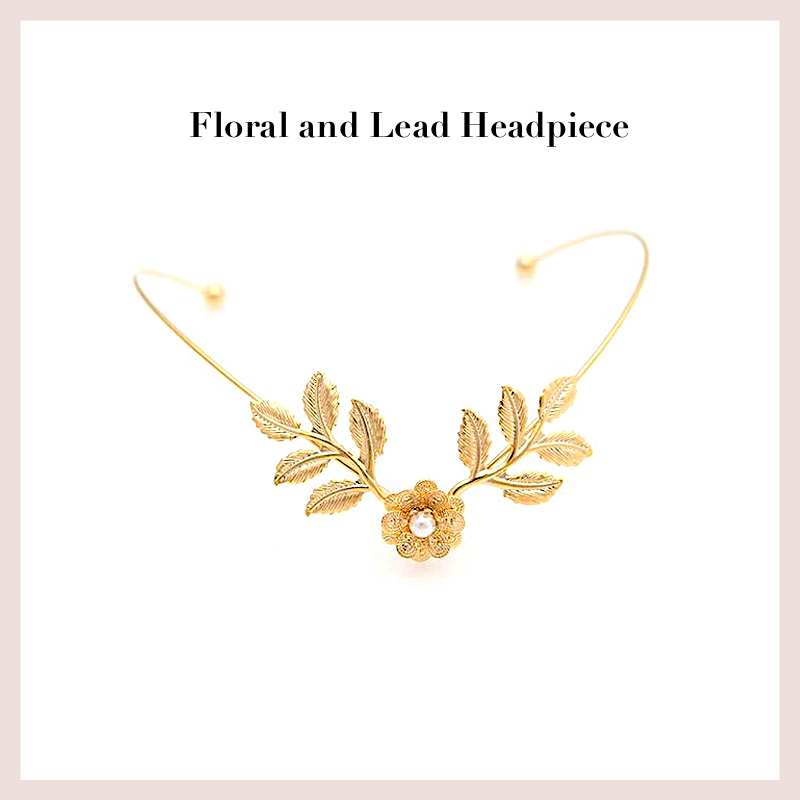 Style your hair with this beautiful golden floral and lace headpiece. Regardless you have straight or curly hair, this headpiece is sure to looks flattering on you! 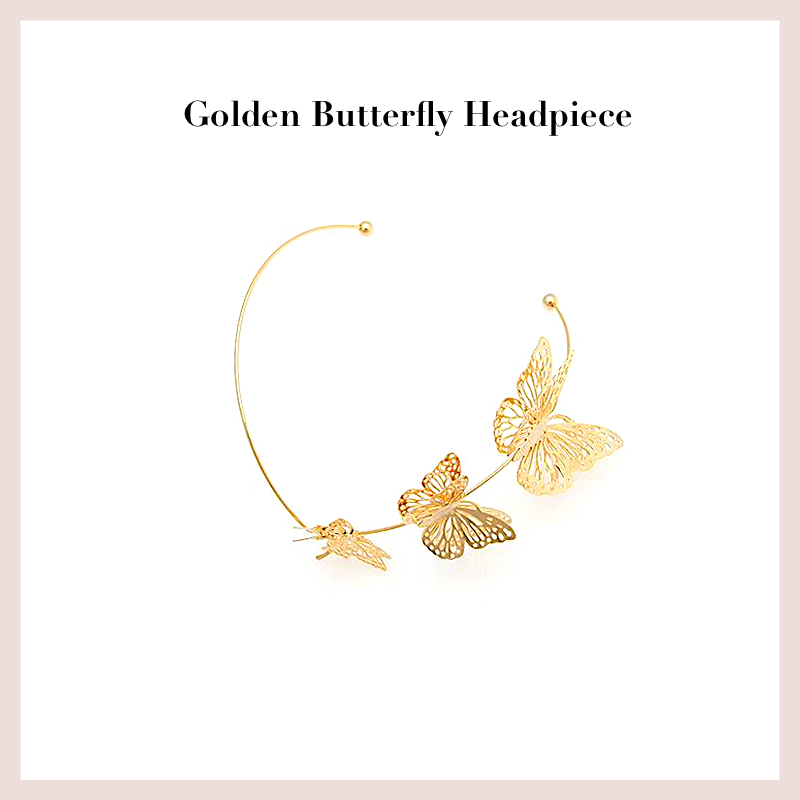 Absolutely beautiful golden butterfly headpiece which is the perfect accessory for any style of hair – curly, straight, even a messy bun! If you’re channeling the seductive plunge v neckline where your skin and curves are exposed, you have a few options of accessories. For instance dainty earrings, dangle earrings, choker necklace that will elongate your torso, making you look long and lean. Give your look a glamorous twist with this gorgeous gold dreamcatcher with tassel drop earrings. 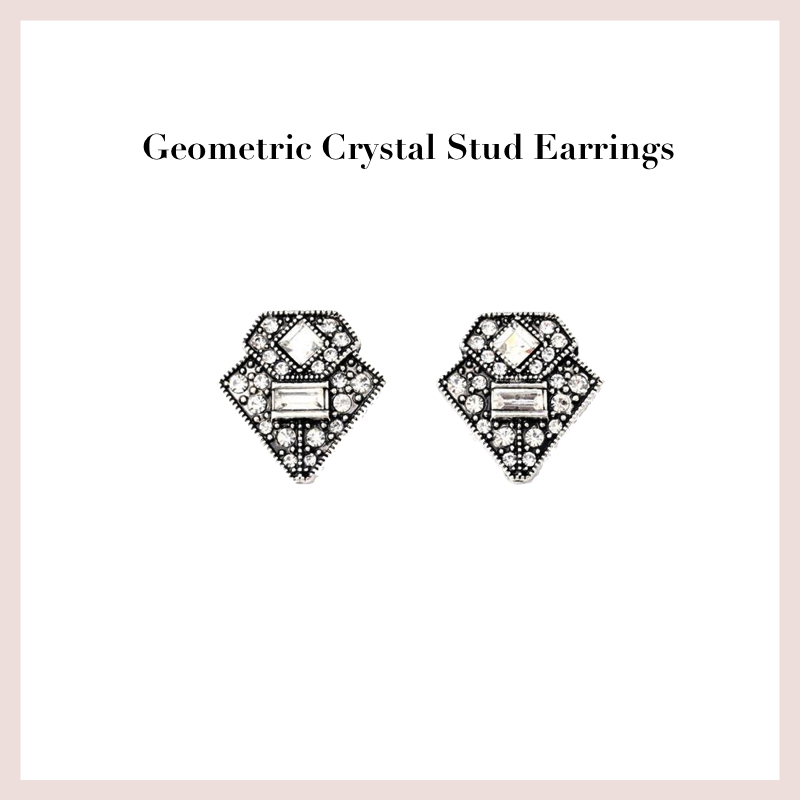 Amp up the glam of your evening look with this absolutely stunning geometric crystal stud earrings. 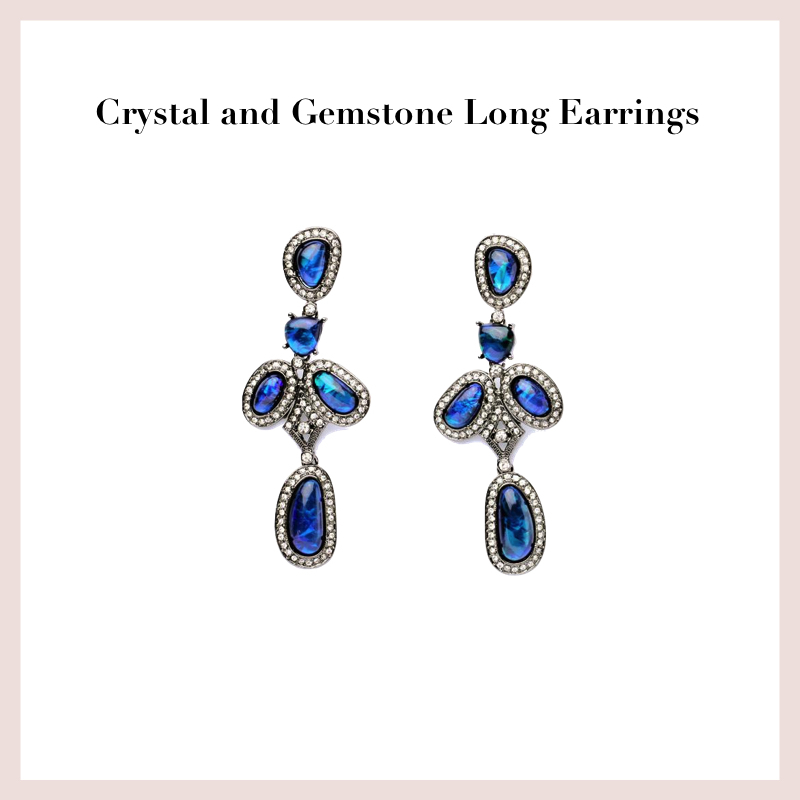 Dazzle the night away with this heavenly gorgeous crystal and blue gemstone long earrings. 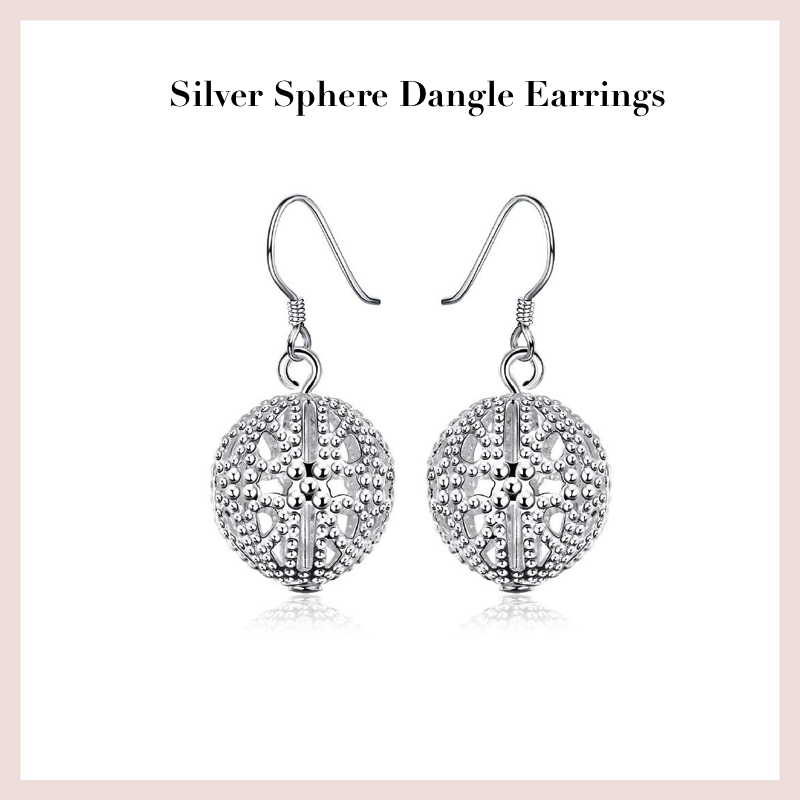 Look simple and sophisticated with this delicate pair of silver sphere dangle earrings. 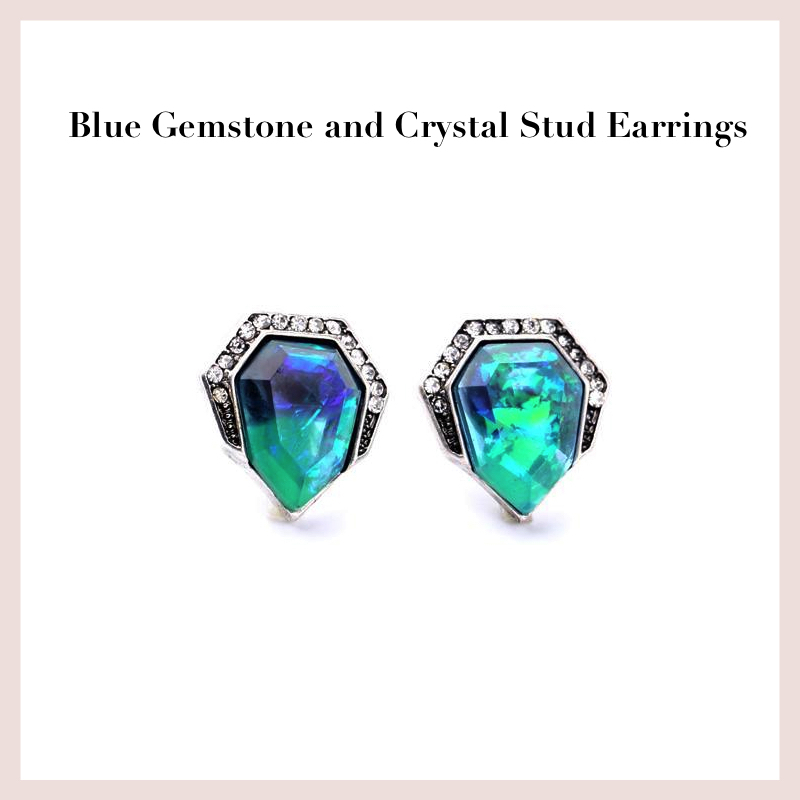 Make your look stand out in this pretty blue gemstone and crystal stud earrings. That’s all for today’s topic and I hope you guys find this helpful in picking the perfect jewellery pieces for your prom dress style! Do not hesitate to leave us your thoughts because we’d love to hear from you! Stay tuned for more topics from us as we update on every Monday, Wednesday, Friday and Saturday. 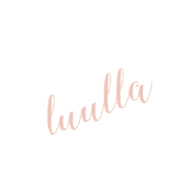 What a lovely blog you have! Great read! It’s really obvious you work hard for this post and I wish I had read this before my daughter’s prom night! Aww thanks Katherine! Glad that this post comes in handy!